Photographing the milkweed seedpods was a wonderful experience. The process of creating these images was not as I anticipated. I always plan my photographs very precisely. While I grow most of the flowers that I photograph, in this case I collected the milkweed seedpods from a field in the country. My husband and I went out on a fall day and gathered an abundant supply of the milkweed pods still attached to the stems. I took the dried plants to my studio and set up the pods with background and lighting, all carefully planned. Everything went as expected until the pods became heated under the photographic lights. Due to their increasing temperature, the pods started to open and the seeds were released even before I could complete the first photograph. It was so wonderful to watch the miraculous little structure break open and reveal its incredibly engineered storage of hundreds of seeds, all geometrically arranged within the pod structure. 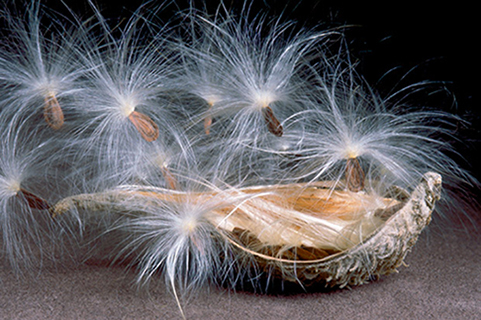 In a few minutes all of the seeds floated out of the pod. Once the process of release started, it could not be controlled or halted. I had a great day capturing on film this small aspect of nature recreated in my studio. By the end of the day I had created series of photographs depicting the release of milkweed seeds from their pods and a studio covered with this delicate bounty. I have dispersed some of the seeds into my garden and the rest I saved to remember the moment.